University of Hawaii at Manoa geology and geophysics associate professor Greg Ravizza, left, and doctoral student Francois Paquay developed a method to use osmium isotope records from ocean sediments to determine the impact sizes of meteorites. A University of Hawaii doctoral student has found that the huge asteroid crash believed to have wiped out the dinosaurs 65 million years ago was only about half the size of previous estimates. Francois Paquay developed a method using osmium isotopes in deep-ocean sediments to determine sizes of meteorites that have collided with the Earth. The asteroid believed to have created the Chicxulub Crater buried under Mexico's Yucatan Peninsula and caused the dinosaurs' extinction had been estimated to be 9.3 to 12 miles in diameter from crater simulations. But by Paquay's calculations, the asteroid was about 2.5 to 3.7 miles in diameter. 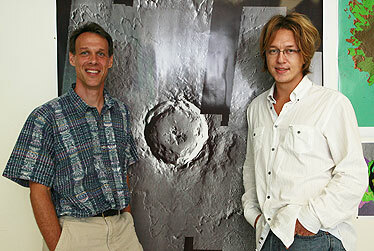 Paquay's research with his adviser Gregory Ravizza was reported in yesterday's issue of the journal Science. 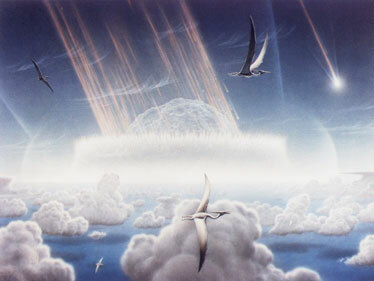 Scientific evidence now supports the hypothesis that a major asteroid or comet impact occurred in the Caribbean region at the boundary of the Cretaceous and Tertiary periods in Earth's geologic history, as illustrated in this drawing. Such an impact is suspected to be responsible for the mass extinction of large dinosaurs, but work led by a UH team shows the asteroid was smaller than had been thought. The asteroid impact believed to have wiped out dinosaurs 65 million years ago was only about half the gigantic size previously estimated, a University of Hawaii doctoral student has found. Francois Paquay, in the department of geology and geophysics, developed a method using osmium isotopes in deep-ocean sediments to determine sizes of chondritic meteorites that have collided with Earth. By his calculations, the asteroid believed to be behind the Chicxulub Crater under Mexico's Yucatan Peninsula - and the dinosaurs' extinction - was about 2.5 to 3.7 miles in diameter. It has been estimated from 9.3 to 12 miles in size from crater simulations. Many other species also disappeared after that impact, although global warming and other theories have also been advanced as the cause. Paquay's research with his adviser Gregory Ravizza was reported in yesterday's issue of the journal Science. Collaborators were Tarun Dalai of the Indian Institute of Technology and Bernhard Peucker-Ehrenbrink of Woods Hole Oceanographic Institute. Paquay explained in an interview that changes in levels of the element osmium are well preserved in deep-sea sediments. "What makes it interesting, osmium is very low concentration in sea water but very high concentration in a meteorite. "When it hits the surface, everything is vaporized and everything in the vapor rains down on the land and in the ocean. It changes the chemistry of the water," which is preserved in deep-sea sediments, he said. "Based on measurements you make in sediments, you can estimate how much osmium was dissolved in the sea water and from the impact." The osmium level spiked during the impact events studied, then dipped, he said. "Based on this, you know using simple math what was the size of the impactor." Ravizza said the old method of estimating impact size with the element iridium was labor intensive, requiring data from many different sites. Paquay's approach takes advantage of changes in the ocean's chemical composition preserved in the ocean floor, he said. "It is a chemical fingerprint of the impact." Iridium data also can be affected by a lot of processes, but osmium concentrations are nearly the same throughout the ocean, Ravizza said. The team analyzed more than 130 samples from two Ocean Drilling Program sites in the equatorial Pacific and off the tip of South Africa. They studied two geologic time periods with well-dated impact events and studied the sediments during and after the impacts, Paquay said. "These events are fascinating to me because of their magnitude," Ravizza said. "They represent huge explosions. ... Yet, in spite of that, what surprises people is the (Chicxulub) event was associated with mass extinction." The impactor sizes estimated with osmium data were lower than those based on crater simulations. But they were minimum estimates based on an assumption that all osmium carried by a meteorite is dissolved in the ocean, Ravizza said, suggesting "perhaps some of it stayed on land. That's why we think the estimates are slightly lower than the iridium estimates." "One of the cool things about this (osmium method)," he said, "is we can go to just one or two sites in the world because osmium is very well mixed in the ocean, where we need multiple sites to determine the size of the impactor using iridium." He said his technique "gives you more confidence in the data set." It can be used now to identify unrecognized asteroid or comet impacts, even those as small as about 1 mile in diameter, he said. » On Faith: "Whose story are we in?" » Here a chick, there a cat?